In spite of significant advances in detecting fluorescent and luminescent labels, oligo-enzyme conjugates continue to be the most sensitive reporter groups. For most applications, direct conjugation of enzyme to oligonucleotide offers the best overall performance with the highest sensitivity, specificity, simplicity and rapid detection. Nucleic acid enzyme conjugates eliminate the need for radioactivity in most assay systems. Bio-Synthesis offers custom enzyme-oligo conjugation services by coupling oligonucleotides to alkaline phosphatase (AP), horseradish peroxidase (HRP), Bovine Serum Albumin (BSA) or Soybean Peroxidase (SBP). Such oligonucleotide-enzyme conjugates ("oligozymes")can be used in a variety of hybridization and detection formats, including dot blots, Southern/northern blots, in situ and solution hybridization/capture schemes. Our 30 years old expertise in the field of nucleic acid chemistry have assisted client in creating high quality oligo-enzyme conjugates with the flexibility to be adapted to your special requirement. There are two ways to place enzyme-oligonucleotide conjugation services. 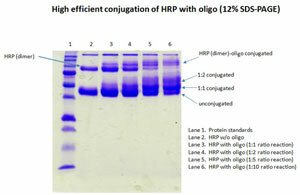 You may request your conjugation services by final set amount of oligo or enzyme starting material. Starting at $800 and up for enzyme-oligo conjugation service. Price varies from type of enzyme used, amount of starting material or final guaranteed set amount. Please contact us for a quotation. Enzymes maybe modified to contain reactive groups useful for conjugation with oligonucleotides. This can be achieved by using homobifunctional or heterobifunctional cross-linkers that can covalently couple to enzyme and result in terminal reactive group that can cross-link with oligonucleotide containing an amine, thiol and aldehyde modified oligonucleotide. Thiol modified oligo is manufactured under strict, quality control processes. Analytical HPLC and MS analyses are performed in every development cycle. Thiolated oligos are conjugated with SPDP-activated enzyme followed by dialysis, gel filtration or use of the centrifugal concentrator, to remove excess cross-linking reagents and oligonucleotides. Whereas, we can chemically link the intended components of a conjugated molecule, there exists the possibility that the binding sites/active sites of the protein can be altered/modified (partially or completely) independent of the stoichiometry used. 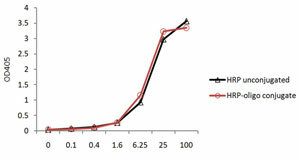 Sometimes this activity loss is caused by physically blocking the antigen binding sites, during conjugation or by conformational changes in the complement-determining regions. Some proteins/antibodies are just too labile to undergo chemical modification reactions, regardless of the coupling methods used.